I made a wonderful mexican pizza sauce last night (at least I loved it). I wanted to share how I made the entire pizza mainly so I won’t forget, but also in case others would like a recipe for the same dish. Keep in mind I like spicy, hot mexican dishes. First I poured a can of mild salsa already canned into a medium sauce pan. Recipe for the salsa can be found on this blog by searching for salsa or click here. I used about a 1/2 quart of this salsa. Next, I took a can of diced tomatoes with green chiles and drained the water off as much as possible, then poured the remaining tomatoes and chiles into my blender. You may need to use food processor, but I use the puree cycle on blender most the time. 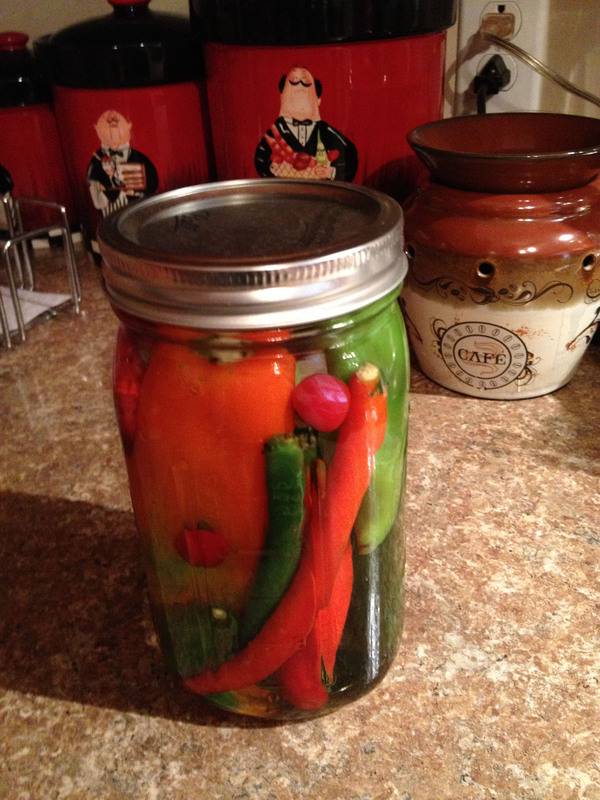 Next, I had a jar of pickled hot peppers from the garden from last year. If you do not can your hot peppers, then buy a variety of hot peppers from the store if it is not growing season where you live. Add as many as you like to get the desired hot flavor. I used a little over half quart of hot peppers that I had canned of about 5 varieties of hot peppers. I did not use any jalapenos as my hubby does not like the taste of them (just a little sidenote). Next, if your salsa was not thickened with tomato paste when you canned it, add about 1/2 can tomato paste to your blender mixture. If the paste is in the salsa however, do not add more as it will not be necessary. Add garlic cloves, I added 5 to my batch and when I puree’d I used the pulse setting to make sure they got cut up totally. Puree the ingredients in the blender and then pour them into the sauce pan with the mild salsa. Stir together and cook until thickened and until tomatoes are done, I simmered probably an hour or so on the low burner of my propane stove that is made for soups and sauces. Once you have cooked the sauce to your desired consistency, you now have a mexican pizza sauce ready to be used as your base for your mexican pizza. I made a pizza crust, added sauce just as I would a regular pizza, then I added taco meat on top and cheddar/jack blend of cheese. I baked the same as a regular pizza. I topped with sour cream when serving as it helps with the hotness of the sauce and is good with it.